Krify Software technologies Pvt Ltd is a renowned mobile app development company which is expertise in Messaging app development. We have well talented and dedicated team of mobile app developers working on various platforms. We deliver quality outputs to our valuable clients. Mobile messaging apps are trending and mostly used apps as they contain social networking features, enable a secured chat, allow internet calling, share pictures, videos, memories and many more. People are inculcating these messaging apps to stay in touch with friends and family. Whatsapp, Facebook Messenger, Skype, Telegram, Line are some of the top rated messaging apps having their own specifications. Are you looking to own or develop whatsapp like messaging mobile applications? Contact our team to get a functional-rich, user-friendly and typical mobile messaging featured application. Right from initiation phase to deployment phase we work focussing on our client requirements in order to deliver quality products. 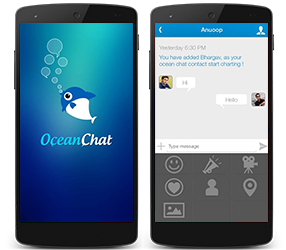 We are noticed in developing best messaging and chat applications that transform the way your users communicate. Ad free as no Ads are displayed though connected on internet. Messaging app development implements cloud services where data is stored and retrieved from cloud. Whatsapp like messaging apps synchronizes with web app which helps user to communicate on large screen. Users can customize the font, background image, etc to add a spice of customization. The users can able to know if their contact list people are available online or not. A picture speaks louder than words and so the use of emojis helps user to convey their emotions. The messenger app development is compatible on multiple platforms say Android, iOS and windows.